Stornoway Diamond Corporation (TSX:SWY) announces an update to the Renard Diamond Project Mineral Resource estimate – LONGUEUIL, Quebec, Sept. 24, 2015 (GLOBE NEWSWIRE). A 16% increase in the Indicated Mineral Resources of Renard 2 to 21.6 million carats achieved through the conversion of Inferred Mineral Resources to 700 meters depth. New Inferred Mineral Resources at Renard 2 defined to 850 meters depth. The inclusion of over 4 million tonnes of lower grade Renard 2 Country Rock Breccia (“CRB”) material in the Indicated Mineral Resource category for the first time. Substantial new exploration potential at Renard 2 and Renard 3 identified to 1,250 meters depth, where both kimberlites are interpreted to retain sizeable widths and remain open. Updated mine plan now under development to incorporate increased Indicated Mineral Resources. Support materials that illustrate the updated Renard Mineral Resource Estimate can be found on Stornoway’s website at www.stornowaydiamonds.com/English/our-business/renard-project/technical-resources/default.aspx. Stornoway will file a Technical Report for the Renard Diamond Project under National Instrument (“NI”) 43-101 – Standards for Disclosure for Mineral Projects (“NI 43-101”) within 45 days of this release. 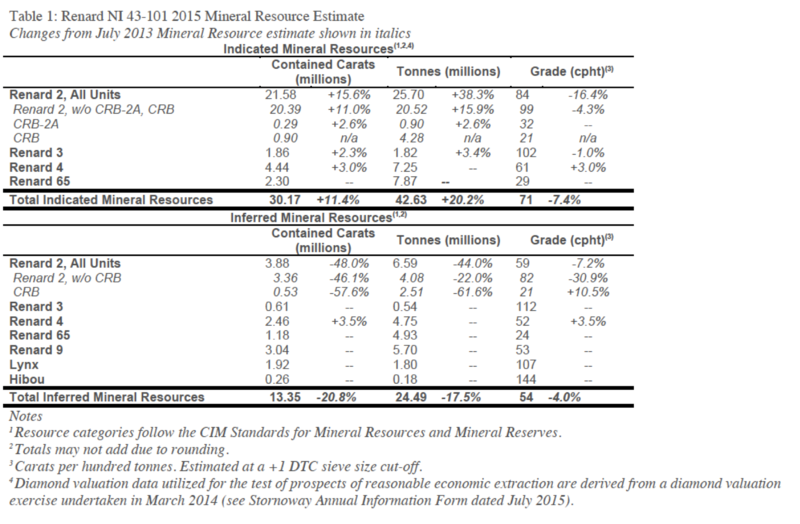 To read the full original press release visit the Stornoway web site at: Stornoway Announces Updated Renard Mineral Resource Estimate.